Well, Momoiro Clover is pretty ridiculous. But I think it's just like... the credits theme. I haven't seen the movie because I'm gonna wait for the DVD for a movie that I won't be able to understand. But from the teasers I've seen it's basically a Blair Witch-type horror movie. The girls are playing themselves, and they even told the fans in June that they were going to be filming a TV show (or something, man, it's hard when you don't know Japanese during those announcement MCs). So during this TV-filming things got crazy! And that's what the movie is about. The implication was also that they didn't even tell the girls that it was going to be a horror movie until after the shooting for the "TV show" was finished, so that they could really scare them. But, um, these are idols, so who can you believe. I think something like spirits start to possess the girls and the "shirome" is how their eyes get all white when they're possessed. Oh the places I could go. Here's a Full Version of Coconuts performed live. (1) Today they unveiled "Pinky Jones" at the live event. They showed off their Native American-inspired costumes. They are 800 times better than plastic bras filled with fruit. The first time they performed it, the complexity of the costumes caused much amusement: Kanako's headpiece flew off, Momoka's bracelets flew off, and Akari forgot to wear one of the wrist parts. They didn't use the headpieces any of the other times. Then at the end they showed the PV. The full song is on the website. It's a bit too generic of a song though. But I do like the second half of the song much better than the first. Also, Momoiro Clover tends to make everything they do fun no matter what, so it is saved by a PV that I think is really good and a dance that is wonderfully ridiculous. The full PV has a cute little drama section before the song. Kanako, as the group's leader, is the chief. Akari and Ayaka are the tribe's guards or something. Shiori and Momoka are the village youth (or something). And Reni, of course, is the village mystic. (2) The third A-side was unveiled yesterday. It's called "Kimi to Sekai". Its video is super-cheesecake with the girls licking ice cream cones. But they're also wearing leather motorcycle outfits with ridiculously crimped hair. It's a new look for them. I could see Berryz wearing these costumes. The song is more of a hard sound. There's a 15 second preview on the website. yay new Momoiro Clover stuff!!!!! I love Pinky Jones. The instrumental has an early indie-Perfume sound to it. I like it, the outfits are... original. Don't care much for Kimi to Sekai though, it feels too AKB48ish. I like the Pinky Jones PV! It's really energetic! And that part where the girls names are interpreted into the lyrics is cute. I agree about Kimi no Sekai being AKBish. Pinky Jones is kind of all over the place, but it's pretty cute. I like how they include all of the girls names. I'm not feeling Kimi to Sekai, it just doesn't seem like them. But the preview I found was only 16 seconds, so maybe it gets better. Yeah, at first Pinky Jones was kind of hard to follow...but after listening to it more, its easier. I love how they get a budget of 10 cents and still manage to make it entertaining. Their acting skills could be better, haha, but the "chapa chapa" is cute. This disturbs me greatly. D: Em-El go tell her to eat a steak or something. I have noticed that her face has looked different, but I feel like this article has very little in the way of evidence. Her face is at different angles and she's making different expressions in those photos, some are taken with a cell phone and others are taken professionally, etc. When I saw her just a month ago at the handshake event, she seemed healthy looking? But of course, I only saw her for a few moments. TokyoHive isn't exactly known for mature reporting. Sure the pictures they chose don't look very good, but it's because they chose them. I admit she hasn't been looking as healthy as the old pictures, but I assumed it was simple tiredness. They've been promoting this single for like 3 months of events (they're also all in school). Last May they all got sick because of their events. Anyway, when I saw her, I thought she just looked tired, but what do I know about eating disorders. Hey, Momoiro Clover got big enough for a stupid article in TokyoHive? Yay! In brighter news, they will be performing their third single at their Christmas concert. I think TokyoHive gets all it's Japanese news from 2Ch. Despite the fact that it may not be true, the pictures are still pretty creepy to look at. Either way, she certainly doesn't look well. Stress can cause a certain amount of change in one's appearance, I know that I myself once lost nearly 10 pounds in around 2 weeks due to severe stress, but her skin looks so...grey, something I've seen in many ED sufferers. Eating disorder or not, I have trouble believing she's well, that's for sure. She looks like hell lately. Heyy MomoClo fans! I finally got my bajillion copies of the Pinky Jones single from the event I went to. I have an extra copy of the RE (see covers here) and 4 extra copies of the adorable photo of MomoClo in wedding dresses (shown on that same link, first photo for アニメイト). If anyone wants any of these things, I'd be happy to mail them your way for free. Momoiro Clover's songs are written and produced by Maeyamada Kenichi AKA Hyadain! At least Coconuts and Iku ze! Kaitou Shoujo, which were already my favorites anyway . Just learned of that today from his Twitter. No wonder their songs are so infectuously catchy and fun, right? I want that Pinky Jones single and/or the picture too ;_; But I'm in EU so maybe it's better to send to PQ instead? PQ PM'd me first, so she's got dibs on the single - but I've still got two photos left, if you'd like me to send one your way! Shipping is ultra cheap for me at work, so I don't mind shipping out of the country. ///, I got your back. I still haven't given away my CDs-acquired-by-wotadom yet. 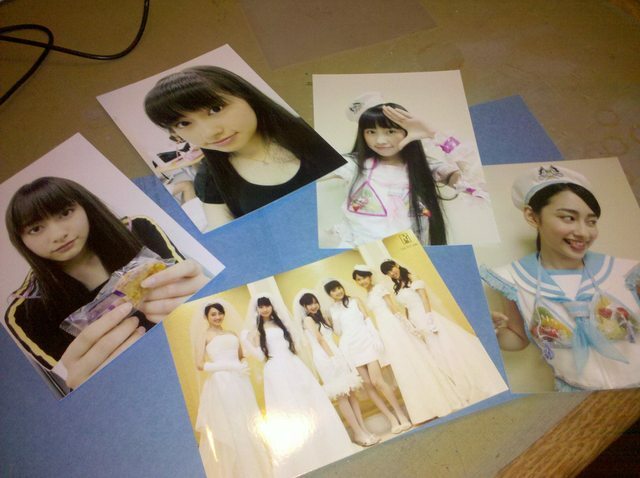 Aww, I got into MomoClo by Em-El giving me CDs-acquired-by-wotadom. And now I'm joining the team, haha. I WATCHED SHIROME TODAY. It was entertaining. They're all so adorable and lovable. Since I've spoken of other Stardust matters in this thread before, I'll also point out that (in addition to making Oshima Mai's solo singles and doing lots of past work with Koharu and the Eggs on the Kirari anime), he composed/arranged two of the best songs on Stardust-promoted soloist Aso Natsuko's surprisingly good album: Perfect-area Complete! and Movement of Magic. Also he did her latest single. He also produced, composed, arranged, and wrote the single for Momoiro Clover's little sister group, Shiritsu Ebisu Chuugaku: Ebizori Diamond. Unfortunately it came with a remix, not the instrumental, so we can't remove the 12-year-old voices. Yeah, he did say "Hyadain"'s voice made a debut, so I'm guessing that voice in the background for the opener might be him. But I looked it up on his site, and he actually did everything on those two songs: lyrics, composition, arrangement, and voice coaching. What a talent! I always had a sneaking suspicion he was a voice coach though, since he has such a huge range. That really comes in handy for that. EDIT: Haha, those Aso Natsuko songs are really cute. Movement of Magic is especially amazing! He has this way of phrasing melodies in straight rhythmic lines in a lot of his stuff, it's actually really signature for him it seems. It's also probably the best audio source for Zenryoku Shoujo. By the way, in the concert scene of the movie, I'm visible in the crowd for a whole second. P.S. There's a special CD only on sale at the Christmas Eve show next week. New music! They dialed the tempo way down, but it's about snow I guess, so it's okay. It's still the slowest thing they've done since their first b-sides. And then three of their four most common cover songs are finally released. But not the best of the four As the guy behind me in line was saying in Japanese to his friend "'Tsuyoku Tsuyoku' isn't on it. That makes me kinda sad." The concert was fairly awesome. It was their first concert in a big hall so it was a big deal, and they certainly embraced it with the biggest budget they've probably ever seen. The crowd caused Shiori to cry before they could even do their introductions (when they left they were mostly wet-eyed, but Akari was bawling). It was a real concert. With a video board playing animations and video shoots, there were even two solo songs (! ), and 5 sets of costumes and only the initial ones were old (and that number is not including the adorable yellow dress Shiori wore for her solo and the fierce outfit Akari wore for hers). They even had moving stage parts! In other words, it sounds like it's time to start printing DVDs, Stardust. During the VTR they played at the first costume change, it was a quiz game. Akari and Kanako both individually said that the cutest Japanese idol group is Smileage. After they came out in the encore in Santa outfits dancing to ""I Saw Mommy Kissing Santa Claus", they sang "Last Christmas" with adorable accents and then they sang their new song. New Single: March 9, 2011. Three versions. Two limited editions each with a DVD of a separate PV. The regular edition will have a third song on it. Then they announced all their upcoming tours. Basically they're hitting 'big' time and performing at the Zepp family of venues and Nakano Sun Plaza. The first time I saw them there were barely 100 people there. There were 1300 today. Could someone tell me what This vid is all about?